Disclaimer: I was provided with a copy of the new Minions DVD to review and my opinions are my own. Your views may differ, thank you! 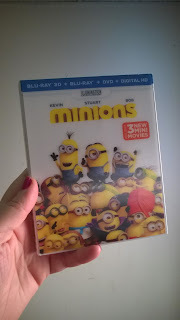 The NEW Minions DVD is out, TOMORROW on DVD and Blue Ray and you are going to LOVE IT, especially if you love those little yellow bundles of fun! We have watched it once a day or more for about a week, now, and it doesn't get old! The Minions roam from one evil boss to another before stumbling across the exquisitely evil Scarlet (voiced by Sandra Bulluck) at an evil convention! The majority of the movie takes place in England and involves a plot to get Scarlet the Queen's crown, and position of Queen, too! A lot of comedic mishap and fun abounds and you'll laugh, you'll cry and then you'll cry laughing! Completely over-the-top fun, with so many references to the fact that it is based in England that I (as an English woman) wasn't 100% sure if I was laughing at myself, or a little offended by all of the tea and polite jokes, but it fit and it worked - and it didn't go unnoticed that Scarlet's husband Herb looked just like Prince Charles, whether deliberately or not, I couldn't quite tell, but this is a very English movie! My children love the movie and even my 2 year old gets all of the funny parts and laughs along. This is a true family movie and worth the money you pay for it - it would make great in any Christmas stocking this year, it won't let you down!! Minions is out TOMORROW on DVD and Blue Ray in all good stores near you! You can also buy it online for digital download, NOW! Follow our Holiday Gift Guide online with #MGBHGG and at the tab, above!